What is Artistic Roller Skating? 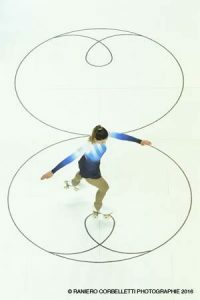 Artistic Roller Skating is similar to the Ice Figure Skating that you see on TV. There are various different disciplines within the sport that you can learn and compete in. Within Ipswich Skating Club we have had skaters compete across figures, free, dance and quartets, although are hoping in the future to be able to offer the other disciplines as well. All skaters are required to train the 3 basic disciplines competed within Britain – figures, free and dance, although they do not necessarily have to compete in them. Compulsory or school figures involve maintaining a running edge on a circle and performing specific turns. It requires precision and accuracy and is judged based upon how well the tracing is held the quality of the edge running and the quality of the turns. Free skating is an individual skater performing a routine to music that involves jumps and spins. It is judged based upon the difficulty and quality of the elements performed along with the artistry displayed by the skater. Torvill and Dean, but on Roller skates is probably the best way to describe this discipline. A male and female skater will skate compulsory dances (set steps and a pattern to music) at the younger ages, and a style dance (a pre-selected style of music each year (e.g. Swing Medley) with required elements, including a compulsory dance section) and free dance (couples choice of music and routine with required elements). Similar to Couples Dance Skating but by an individual. Compulsory dances are skated by the younger skaters, with free dances and styles dances being skated by the older ones. This is one of the most impressive disciplines for viewers, with all of the high lifts and girls being thrown into the air, along with the jumps and spins of free skating. This involves a group of 4 skaters performing a routine together. It has more of a show element towards it with introductory words to explain the storyline or theme behind the performance. 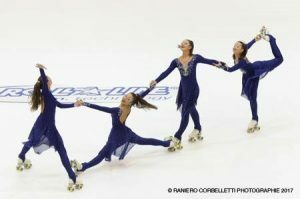 This can be done with small or large groups of skaters and requires the group together creating a show style performance. This involves a group of 16 or more skaters performing together in complete synchronisation. Artistic Roller Skating is for anyone who has completed the Gosk8 grade scheme an wishes to pursue this type of skating. Within Artistic there is the opportunity to compete at various different levels, from basic skills competitions for those taking their first steps within artistic, through club, national and British competitions to international events including the Roller World Games and the Artistic Roller Skating World Championships. Skaters can also progress through the FARS tests, and have had the chance to train at clubs in other countries. 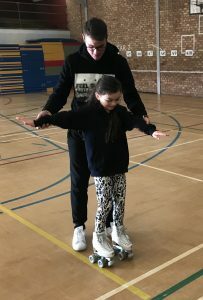 Skaters that have completed the Gosk8 grade scheme are able to start artistic on a Saturday morning at Gainsborough Sports Centre. 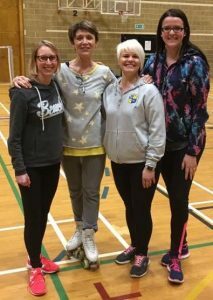 From this session skaters will be selected based on ability and work ethic to start on a Tuesday at Whitton and will then be invited to train at the Felixstowe Artistic sessions, when it is considered appropriate for them to do so. Charlotte has been the main artistic coach at Ipswich from the beginning, taking the first artistic skaters to competitions when she was only 17. Within the first year of the club having competitive skaters she had trained a skater to 2nd in Britain for Tots girls, gaining the skater a place on the GB squad. At 19 she had 2 skaters selected to compete at the Amphora Trophy in Croatia, and by 20 had coached her first British Champion. 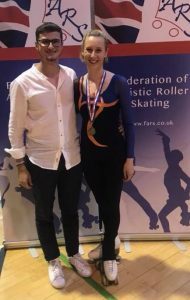 Since then skaters have regularly medalled within the British Championships, and Charlotte has gone abroad with the British team as a coach to the Cup of Europe on several occasions. She is also still actively competing herself, currently being the top Senior Ladies Figure Skater in Britain and having represented Great Britain at the Saen Trophy (Holland) and German Cup in 2018. To further her own skating she has been travelling abroad for the past few years to receive coaching from some of the top coaches in the World including spending 3 weeks in Buenos Aires (Argentina) with Maricarmen Sanjuan in 2018, attending seminars in Italy with Raffaello Melossi and working for a couple of years with Mario Vitta (Italy). She is also currently working with Alessio Giangi (current European Senior Mens Figure Skater) via video and through his trips to Britain. Prior to an injury Charlotte also competed to a high level in solo dance having represented GB as a junior skater in the Cup of Europe and as both a junior and senior skater at Hettange international (France). She has also been used as a skater within a Sky Indent and an episode of TOWIE. Through her work with international coaches Charlotte is constantly updating her knowledge and keeping up-to-date with techniques. 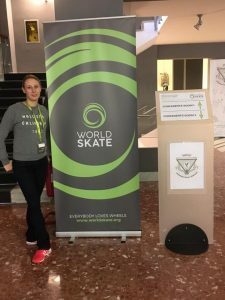 In January 2018 she spent 5 days in Rome at the first ever World Skate seminar getting to grips with the new judging system, RollArt, and attending conferences on free, dance, pairs and precision skating. She has also attended seminars held in Britain run by international coaches in various disciplines including solo dance seminars with Hugo Chapouto (Portugal), Cinzia Bernardi (Italy) and Alessandro Spigai (Italy), figure and free seminars with Gabriele Quirini (Italy), Alessio Giangi (Italy). Furthermore she has completed various Sports Coach UK courses and during 2018 online courses such as The psychological aspects of sports injury, Improving aerobic fitness and Motivation and factors affecting motivation to ensure she is continually developing her knowledge within the sporting field. The Artistic section of the club also works with Charlotte & Heather’s former training partner Kym Ciara who coaches Herne Bay United Skating Club. Kym has a wealth of knowledge within dance, having competed on a World level as both a solo and couples dancer for Great Britain, and having won the Cup of Europe and British Championships as a solo dancer. 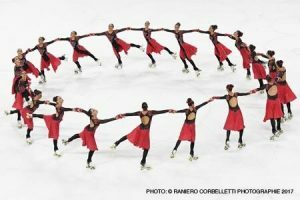 Through the links made with Alessio Giangi whilst he was Head GB Coach, during 2018, Ipswich Artistic skaters have had the chance to be trained by Ali at their home rink benefiting from the expertise of the Italian knowledge.